“I am the living bread which came down from heaven; if any one eats of this bread, he will live for ever; and the bread which I shall give for the life of the world is my flesh. . . . Truly, truly, I say to you, unless you eat the flesh of the Son of man and drink his blood, you have no life in you; he who eats my flesh and drinks my blood has eternal life, and I will raise him up at the last day. For my flesh is food indeed, and my blood is drink indeed. He who eats my flesh and drinks my blood abides in me, and I in him. As the living Father sent me, and I live because of the Father, so he who eats me will live because of me. 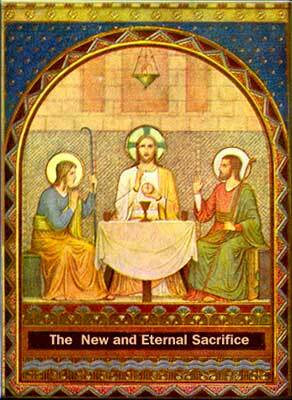 This is the bread which came down from heaven, not such as the fathers ate and died; he who eats this bread will live forever.” John 6:53-58. While they were eating, he took bread, said the blessing, broke it, and gave it to them, and said, “Take it; this is my body.” Then he took a cup, gave thanks, and gave it to them, and they all drank from it. He said to them, “This is my blood of the covenant, which will be shed for many. Mark 14:22-24. “The memory of Christ Jesus crucified was ever present in the depths of his [Francis’] heart like a bundle of myrrh, and he longed to be wholly transformed into him by the fire of love. In his extraordinary devotion to Christ, he fasted every year for forty days, beginning at the Epiphany, the time when Christ himself lived in the desert. Then he would go to some lonely place and remain there shut up in his cell, taking as little food and drink as possible, as he spent all his time praying and praising God. He loved Christ so fervently and Christ returned his love so intimately that he seemed to have his Savior be­fore his eyes continually, as he once privately admitted to his companions. He burned with love for the Sacrament of our Lord’s Body with all his heart, and was lost in wonder at the thought of such condescending love, such loving condescension. 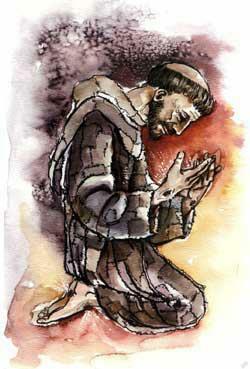 He received Holy Com­munion often and so devoutly that he roused others to devotion too. The presence of the Immaculate Lamb used to take him out of himself, so that he was often lost in ecstasy.” St. Bonaventure, Major Life of St. Francis, IX:2.
and long to be dissolved and to be with You. the torrent of pleasure, the richness of the house of God. with ease and affection, and with perseverance unto the end. and firmly rooted immovably henceforth and for ever.